Hewlett Packard Laser cartridges manufactured by Hewlett Packard for HP machines. 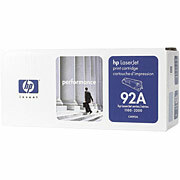 Cartridges available for the following models: LaserJet 1100, LaserJet 1100A, 3200 series. Yields up to 2500 pages at 5% coverage.